William Brewer died of wounds received during a pistol duel with another Wellington lawyer, H. Ross, on 26 February 1844. The duel followed a quarrel over a case in the Wellington County Court. When the two men faced off in Sydney St, Thorndon, Brewer fired into the air but ‘received Mr. Ross’ ball in the groin’. He died four days later. Brewer was no stranger to duelling. In 1840 he had ‘threatened to call out the next man’ who associated him with a certain young woman. Surveyor John Kelly called Brewer’s bluff and was lucky to survive the resulting duel on Oneroa Beach at Kororāreka (now Russell) – part of his wig was shot away. 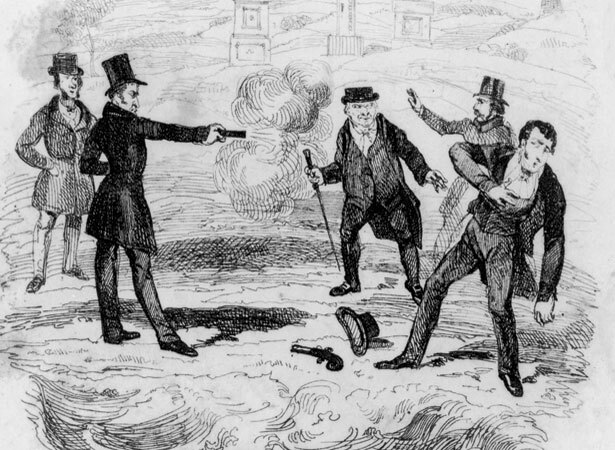 We have 4 biographies, 6 articles, related to 'Pistols at dawn': deadly duel in Wellington.